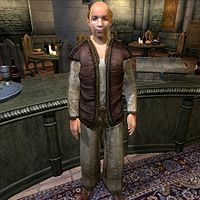 Velus Hosidius is an Imperial publican and the innkeeper at The Merchants Inn in the Market District of the Imperial City. He sells food and rents beds 24 hours a day, every day. Velus wears a set of middle class clothing consisting of a brown shirt, light brown linens, and a pair of quilted shoes. He also has a reasonable amount of gold. Should you ask him about renting a bed, Velus will tell you: "I do have a bed available, for 20 gold a night. Would you like to rent it?" If you tell him you do not want to rent the room, he will respect your decision and may remind you to come back if you change your mind. If you try to rent the room without having at least 20 gold, he will tell you to look elsewhere for a bed: "You don't seem to have the money for the room. Perhaps you should look elsewhere for accomodations [sic]." If you do have enough gold to rent the room, he will instead take the money from you and provide you with directions to the room: "Very good. It's up the stairs there, first door on your left. Sleep well." If you ask him about a bed after you have already rented the room, he will simply remark: "You've already rented the room.... Not much more to say, is there?" With Fighter's Stronghold installed, selling items to Nilphas Omellian results in the same items appearing in Velus' inventory. Esta página foi modificada pela última vez à(s) 01h32min de 22 de agosto de 2013.